For many west coast wine drinkers, South Africa is relatively un-mined enological territory, though that country has a winemaking history longer than California's! The Dutch established an outpost in South Africa back in the mid-1600s and it's said the first grapevines were planted in 1655. The primary idea of their farming was to provide food for their sailing ships heading to and returning from India and environs. Records show the first vintage in South Africa was 1659 and the wine did not score well, apparently, on The Wine Spectator 100 point scale. There were French immigrants who brought some know-how to the region in the very late 1600s. We read there were major problems with "storage" vessels and wines were put into containers which had been used to brine meats. Critics of the day judged these wines as "not worth their salt," we are told. The British came to South Africa in the early 1800s and since they were often engaged in some sort of kurfuffle with France, wines from South Africa found a market in Jolly Olde England. Wine production quadrupled. When relations between France and England became amicable, South Africa's wine industry fell upon hard times. And shortly after that, the influx of the root louse, phylloxera, also damaged the wine industry. In the early 1900s, the South African wine growers were on the ropes, but the unifying work of an enterprising fellow saw the advent of a grape grower's cooperative winery called KWV...this business is still viable and thriving and it saved the bacon of many families in SA wine country. In the 1920s, a prominent viticulturist, Abraham Izak Perold came up with a new variety which has become South Africa's "own" grape, Pinotage. Perold cross-pollinated Pinot Noir with Cinsaut and, voila! : PINOTAGE. The year 1990 marked a change in South Africa from a political and social perspective. Nelson Mandela was released from prison and the country began making inroads in foreign markets. These days few people balk at buying South African wines on the basis of politics, whereas back in the late 1980s and early 1990s, many consumers were not very enthusiastic about the notion of purchasing wines from South Africa. These days there are numerous "serious" wines being made in South Africa. Here's a statistical chart of recent vintage showing grape planting percentages. 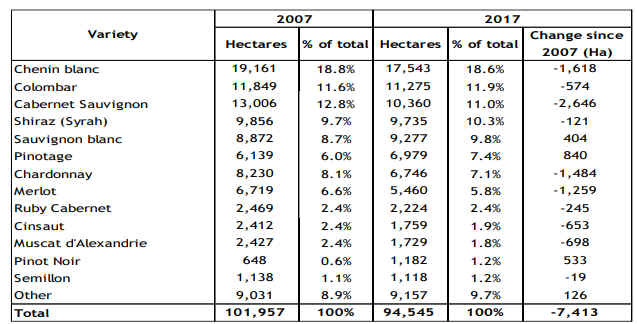 It's interesting to note that over the past decade, or so, vineyard acreage is decreasing. There are many small wineries in South Africa. 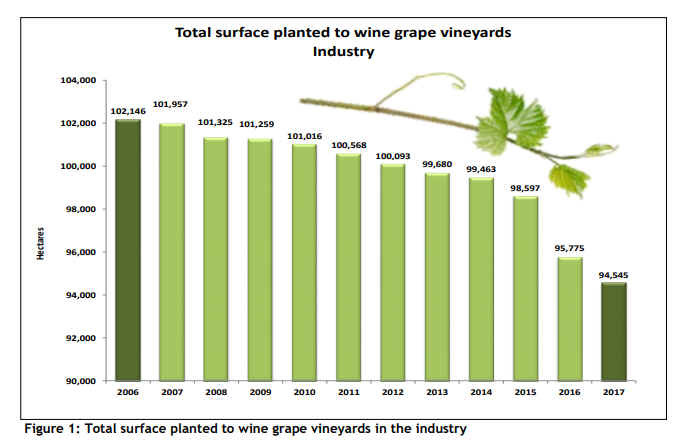 The industry is experiencing a bit of a boom period, despite the modest decrease in vineyard plantings. We should be seeing a dramatic increase in quality (overall), as some of the leaders there will put pressure on the rest to keep up with the competition. There are more than 3000 growers in South Africa. Latest statistics show something like almost 546 wineries are in operation, down from a high of 604 in 2009. Most wines are "varietal" wines. For the export market, these must be at least 85% varietal. There's a tiny bit of Zinfandel grown in South Africa! Chenin Blanc accounts for almost 18% of South Africa's vineyards. Its local name is "Steen". Its plantings equal those of Chardonnay and Sauvignon Blanc combined. CONSTANTIA--On the south eastern side of the Cape Peninsula, south of Cape Town, this is a good region for Sauvignon Blanc, Chardonnay and Cabernet. There's a legendary Muscat produced there called Vin de Constance, a wine regarded by many as a benchmark. PAARL--North and east of Cape Town, this region encompasses some 20% of South Africa's vineyard land. It's well-regarded as a good site for warm-climate varieties. Chenin Blanc accounts for a lot of vineyards there, but Cabernet Sauvignon, Cinsaut and Pinotage are widely cultivated. . Wellington is the neighboring region. There's more than twice as much Chenin Blanc in Wellington as Cabernet Sauvignon! FRANSCHHOEK--South and east of Paarl and south of Worcester. This region is highly regarded for its Semillon. Shiraz also shows promise. WORCESTER--An hour's drive east of Cape Town, this warm region produces a lot of bulk wine. STELLENBOSCH--Some 45 minutes drive from Cape Town, this is thought of as a fine red wine region. It has quite a range of climates and an equally broad spectrum of soil types. ROBERTSON--east of Worcester, this is a very hot region and makes Chenin Blanc and Chardonnay of note. KLEIN-KAROO--Quite inland, this region is sometimes compared to Portugal's Douro Valley. They do make some "port-styled" wines here and there's a substantial ostrich-farming industry there. OLIFANTS RIVER/ORANGE RIVER--located well north of Cape Town, this region produces some high-yielding vineyards. Very hot in the summer, much of the fruit is destined for distillation. Vineyards are routinely subject to flooding in the winter. 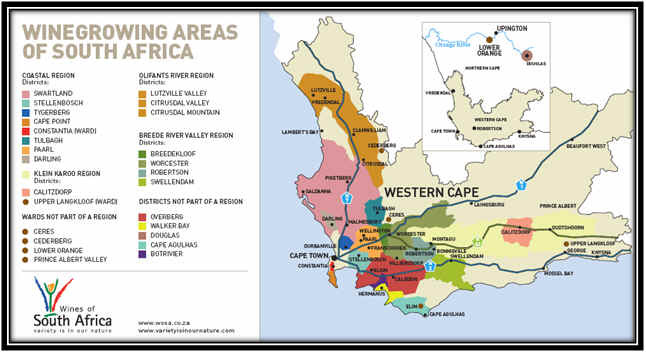 WALKER BAY/ELGIN--A relatively new region for grapes, just to the west of the seaside town of Hermanus. SWARTLAND/TULBAGH--Two very hot regions, Swartland is north of Cape Town and the Paarl area. Tulbagh is a small area just east of Swartland and north of Worcester. I would just like to inquire about some of the wines that you produce in South Africa. I am sure they are quite good, but how can you stomach the fact that you are part of the cause of so many people living so poorly? How can you live with being a big part of so many children being born with fetal alcohol syndrome. I'd like to see you live on that kind of salary. You are a big part of the problem so face it. I sent Elizabeth a response pointing out that South Africa's inclusion as a trading partner with the rest of the world has brought many positive changes. The system of paying people with "alcohol" and having them be, essentially, slave labor, is gone. This change has been made because South Africa is not isolated any longer. Some French wine industry friends visit South Africa and invite disadvantaged workers to learn how to care for vineyards in a Burgundy wine program. Upon their return to South Africa, these people are given vineyard land which they farm for themselves, providing an income for their families on the sale of their grapes to wine producers. This is to be applauded and not discouraged. Nobody forces our customers to buy South African wines. We like having a number of good wines represented in the shop because the quality is on the rise and it helps stimulate the societal changes and economy so necessary! We feature, for the most part, wines from independent producers. Lumping these people in with an antiquated, archaic system is unfair.